So wrote a gentlemanly Irish poet, whose work I had long admired, in the flyleaf of his most recent book. 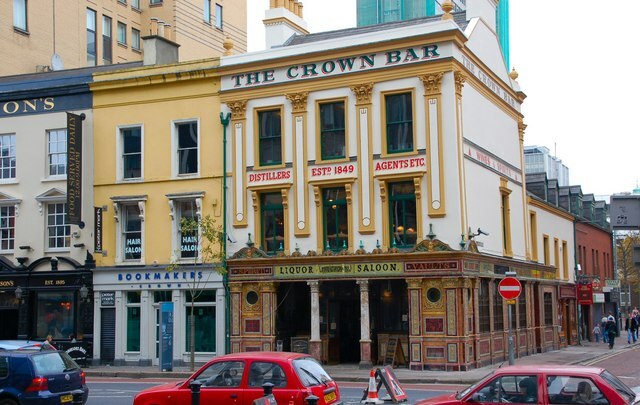 At the time, he and I were having lunch in the upstairs dining room of the Crown Liquor Saloon, a storied old pub in the heart of Belfast, Northern Ireland. I had come up on the train from Dublin to meet him. Of the many inscriptions I have acquired over the years, few have proved as memorable as the one above, partly because the poet’s chosen phrase, faintly archaic but resonantly apt, sorted well with the Crown’s Victorian decor–its ornate tin ceilings, stained-glass windows, and dark-paneled “snugs.” Regrettably, “well-met” is no longer current in North America, either as a description or a greeting. Once the equivalent of “Nice to have met you,” that old-fashioned phrase evokes a singular event: two people meeting, in the fullness of human relationship, at a particular place and time. Fischer’s point is well taken, but as he goes on to acknowledge, in the everyday world such meetings are infrequent. How often do any of us “truly meet one another”? And how can such encounters be engendered and supported? To begin with, we might bear in mind the Japanese motto ichigo ichie, which is commonly translated as “one time, one meeting.” Closely associated with the Zen tradition, ichigo ichie reminds us that every encounter, however familiar or habitual, is a once-in-a-lifetime experience. It is unprecedented and unrepeatable. To be sure, the “meeting” in question might seem as ordinary as having lunch with a friend or getting together after work for a drink. But because conditions are always changing, one’s present experience is in reality unique. By reminding ourselves of that fact, we can cultivate an attitude of freshness toward each new encounter. Norman Fischer shares O’Reilley’s perspective, but he also believes that as listeners we have an obligation to respond. “We cannot only be passive listeners. In the end, listening’s completion is negotiation.“* Toward that end, he recommends two techniques developed by the mediator Gary Friedman. The first is known as “looping” and consists of listening carefully and then repeating, as accurately as one can, what the other person has just said. In this way the “loop of communication” is completed.The second technique, known as “dipping,” consists of pausing during a conversation to “check in with” our own thoughts and feelings. In this way, we take our present state of mind into account–and weigh our words accordingly. Together these two techniques, which Fischer has employed in social contexts as diverse as an employees’ retreat at Yale University and a peace conference in Belfast, have sometimes yielded startling revelations. Participants in the Belfast conference, Fischer reports, were shocked to discover that they hadn’t even been hearing one another, much less promoting peace. Not every meeting can be so rewarding. Some must be purely professional, if proper boundaries are to be maintained. But as Fischer and O’Reilley remind us, and as their experiences confirm, it is possible to approach almost any meeting with full attention, an open heart, and an attitude of deep respect. More often than we might suppose, it is possible to be well-met. * Norman Fischer, Taking Our Places: The Buddhist Path to Truly Growing Up (HarperSanFrancisco, 2003), 9-10,2-3. * Mary Rose O’Reilley, Radical Presence: Teaching as Contemplative Practice (Boynton/Cook, 1998), 19, 21. I like especially the concept of “dipping.” It is not only a way of gauging our present state of mind, but is a mental taking in of breath before the exhalation of “negotiation.” It also gives us a space for more considered response. For me, it requires constant reminding. Thanks for the post!